Former child prodigies, Harry Doubt and Cristal Hernandez, tech geeks addicted to the online game Truth Seekers, decide to take their game offline, with the help of other gamers, to find the truth behind their missing loved ones’ mysterious disappearances. What they uncover inadvertently triggers a chain of events causing the beginning of the end of the world as they know it. “Doubt” is a fast paced story where Harry Doubt online gamer and creator of the Truth Seekers game takes his game offline to search for who or what is behind the disappearances of his mother and his friends’ loved ones, uncovering supernatural forces living among them. Cristal Hernandez started playing the online game, Truth Seekers when she was fifteen. In her real life outside the game, she didn’t fit in with anything or anybody. Classmates called her “the loner” or “weirdo,” taunting her in the playground because she was always nose deep in a book. Her father went missing on her tenth birthday which haunted her every day since his disappearance. Things are never really what they appear to be. Strange things start to happen to her and her friends. She witnesses unexplainable events and is accused of causing them even from people closest to her. Evil is lurking everywhere and disguised as many things.But that’s not all she has to fear. Never trust anyone, her father always told her. Especially your closest allies. …This novel contains a mixture of interesting genres, including fantasy, thriller, adventure, mystery and even romance. The letter in the beginning written to “truth seekers” was a nice touch; a good way to foreshadow what is about to happen. A dystopian adventure, edgy and thought-provoking which raises questions about what we’re doing to our society and planet. – Emily Hill, author of upcoming paranormal novel Voodoo Vision and award winning, The Ghost Chaser’s Daughter and the Ghost Stories series. 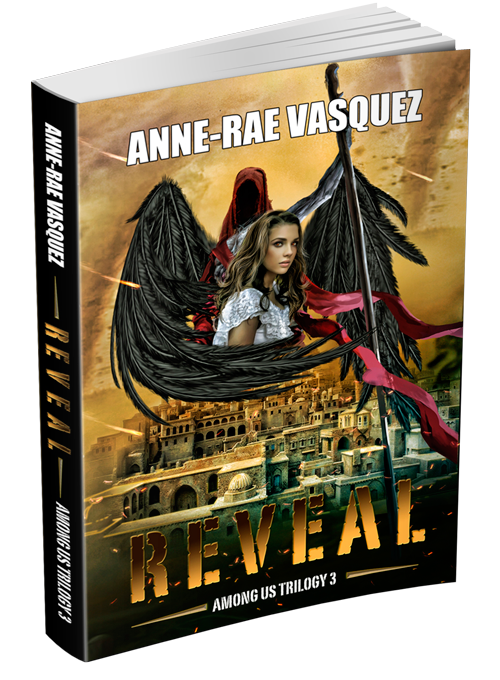 Doubt, Among Us Trilogy 1 by Anne-Rae Vasquez – book trailer from VIF Channel on Vimeo. Anne-Rae Vasquez, is a web design geek, freelance journalist for Digital Journal, author and filmmaker. 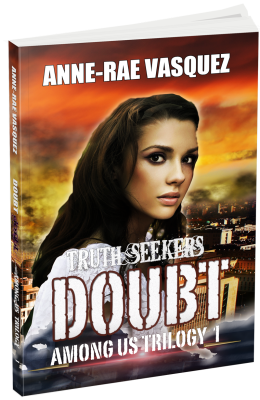 Doubt is her latest novel, book 1 of the Among Us Trilogy. She wrote the novel and screenplay for the award winning feature film and web series Almost a Turkish Soap Opera, Salha’s Secrets to Middle Eastern Cooking Cookbook Volume 1, Gathering Dust – a collection of poems, and Teach Yourself Great Web Design in a Week, published by Sams.net (a division of Macmillan Publishing). Almost a Turkish Soap Opera is her feature screenplay and film directorial debut. I have been checking out some of your stories and i must say clever stuff. Congratulations on the launch-eve of your ‘Among Us’ Trilogy. I’ve watched your writing career over the past year with interest and enthusiasm and have been impressed by your understanding of background dynamics – the politics of relationships, economies, and societies’ reaction to their own history. Wishing you All The Best as you get ready to release the first installment of the Among Us series, Doubt – featuring master-mind Harry Doubt. Clever! Indeed! What an honour to have Emily Hill visiting us here at Truth Seekers Headquarters today! If you are not familiar with her work, Ms. Hill is the Mistress of the Paranormal, author of the Ghost Chaser’s Daughter and other series of Ghostly books with her exciting upcoming novel Voodoo Vision. We are humbled by your kind comments. I hope we may entice you to be an Honorary Truth Seeker one day. We hope you enjoy learning about the Truth, Ms. Hill. But from what we gather, you have already uncovered the truth with your own personal experiences.